Many Mufassirin have stated that the blessed night mentioned in this verse refers to Lailatul Baraat, the 15th night of Shaban. 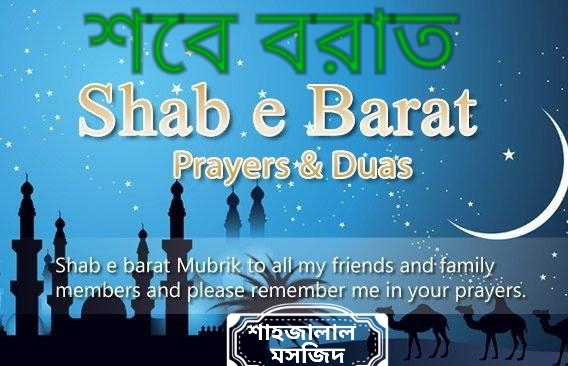 The 15th night of Sha`ban-8th month of Islamic Calendar is known as Lalilatul Baraat, which means the night of pre-ordainment, the night of salvation, the night of abundant rewards, the night of freedom. It is a gift of Allah the Almighty as a mercy to his servants to have opportunity to gain forgiveness and virtues through its importance and significance as well as attaining the maximum sawab in a short span of life. The merits of the 15th night of Shabaan are established by more than a dozen Ahadith. It means that this night should be spent in prayers and other forms of worship. Ummul-Mu’mineen ‘Aishah, Radi-Allahu anha, is reported to have said, “Once Prophet Muhammad, Sall-Allahu alayhi wa sallam, performed the Salah of the night (Tahajjud) and made a very long Sajdah until I feared that he had passed away. When I saw this, I rose (from my bed) and moved his thumb (to ascertain whether he is alive). The thumb moved, and I returned (to my place). Then I heard him saying in Sajdah: ‘I seek refuge of Your forgiveness from Your punishment, and I seek refuge of Your pleasure from Your annoyance, and I seek Your refuge from Yourself. I cannot praise You as fully as You deserve. You are exactly as You have defined Yourself.’ Thereafter, when he raised his head from Sajdah and finished his salah, he said to me: ‘Aishah, did you think that the Prophet has betrayed you?’ I said, ‘No, O Prophet of Allah, but I was afraid that your soul has been taken away because your Sajdah was very long.’ He asked me, ‘Do you know which night is this?’ I said, ‘Allah and His Messenger know best.’ He said, ‘This is the night of the half of Sha’ban. Allah Almighty looks upon His slaves in this night and forgives those who seek forgiveness and bestows His mercy upon those who pray for mercy but keeps those who have malice (against a Muslim) as they were before. Hadrat Abu Hurairah has narrated that the Beloved of Allaah, Muhammad Mustafa said: Jibreel came to me in the night of middle of Sha’baan and told me ‘O Muhammad, please raise your blessed head towards the sky. I asked him, what is this night? Jibreel said: This is the night in which Allaah opens 300 doors out of the doors of his Grace & Blessings and forgives every person who does not join partners with him, does not practice Black Magic, is not a alcohol drinker, who does not insist upon interest, adultery and fornication. Those (who commit these sins) are not forgiven till they do Taubah (Repent). Aisha Siddiqa (R.A) reported that the prophet (sm) said, on this night Allah swt gives details of the names of those who are to be born the coming year and those who will die in it. The deeds of men are taken to Allah swt and all the provisions of man descend in it. In order to observe the Night of Bara’ah, one should remain awakened in this night as much as he can. If someone has better opportunities, he should spend the whole night in worship and prayer. Salah is the most preferable act to be performed in this night. There is no particular number of Rak’at but preferably it should not be less than eight. It is also advisable that each part of the Salah like qiyam, rukoo’ and sajdah should be longer than normal. On the day immediately following the Night of Bara’ah, i.e. the 15th of Sha’ban, it is mustahabb (advisable) to keep fast. Prophet Muhammad, Sall-Allahu alayhi wa sallam, is reported to have recommended this fast emphatically. A large number of the elders (salaf) of the Ummah have been observing the fast of the 15th of Sha’ban. The recitation of the Holy Qur’an is another form of worship, very beneficent in this night. After performing Salah, or at any other time, one should recite as much of the Holy Qur’an as he can. Specially one should recite Surah Fatiha, The first five verses of Surah Al Baqarah, Ayatul Kursi, the last three verses of Surah Al Baqarah, Surah Yasin, Surah Dukhan, Surah Takasur and Surah Ikhlas. One should also perform dhikr (recitation of the name of Allah) in this night. The best benefit one can draw from the blessings of this night is prayers and supplications. It is hoped that all the prayers in this night will be accepted by our Lord, insha-Allah. Dua itself is an ‘Ibadah, and Allah Almighty gives reward on each prayer along with the fulfilment of the supplicator’s need. Even if the purpose prayed for is not achieved, one cannot be deprived of the reward of the prayer which is sometimes more precious than the benefits one strives for. The prayers and supplications also strengthen one’s relation with Allah Almighty, which is the main purpose of all kinds and forms of worship. According to a hadith, Prophet Muhammad, Sall-Allahu alayhi wa sallam, went in this night to the graveyard of Baqi’ where he prayed for the Muslims buried there. On this basis, some of the fuqaha hold it as mustahabb (advisable) in this night to go to the graveyard of the Muslims and recite Fatihah or any other part of the Qur’an, and pray for those who have passed away. After doing all kinds of Ibadah we should raise our both hands, supplicate to Allah Almighty to convey this sawab to Rasoolullah, Sall-Allahu alayhi wa sallam, all the prophets, the sahabas, Awliya Allah, Shuhada, the whole Ummah and for the souls of our Parents, relatives and teachers who have passed away. There are many other virtues of this night. From the time of Rasoolullah, Sall-Allahu alayhi wa sallam, Muslims all over the world have been observing this blessed night through Ibadah and keeping vigil at night, visiting the graveyards and listening to the Islamic Lectures. Our humble appeal to Muslim brothers and sisters is that the Satan with his strong network is trying his utmost best to misguide this Ummah through conflict and divisions, we need to stand, united against the devil and seek help from Allah Almighty through constant and sincere Ibadah, specially in blessed nights such as Lailatul Baraat. 1A Eileen Grove, Manchester, M14 5WE.